So I got this little gizmo and 8 Sanyo Eneloops in the mail the other day. 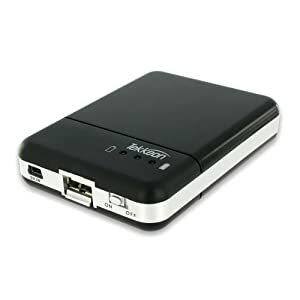 The TekCharge is an emergency power pack--runs off 2 or 4 recharge AAs to provide power to a USB port. You can charge any USB-cable portable device with it. You can also use the TekCharge as a charger, to recharge the AA batteries through a mini-usb port built into the device. So, with this device and some AA rechargeables, you could keep your portable electronics going for quite a while. I'd intended to add this to my EDC bag, to provide backup power for my iPod, cell phone, flashlight when they're running low. Nothing too critical, but I like having a backup. I have a little Duracel battery backup that I currently use, and it's come in handy several times--on long plane rides, when I haven't had a power source easily accessible, or when I need to recharge a device while on the go. I've already switched my chargers over to a Griffin PowerBlock wall charger and car charger . This cuts down on the number of bulky chargers I need to haul around--with these two and a few cables, I can charge any USB device in a car or from a wall outlet. With these two gizmos, I could use the the Tekkeon to recharge batteries from a wall outlet or while in a car. However, all did not go as planned. After receiving the TekCharge, I gave it a quick run through. Popped the brand new Eneloops in and hooked it up to my iPod touch, which had only about 1/3 of a charge left. Worked as planned, charged up the iPod pretty quickly. But after unplugging the TekCharge from the iPod, I couldn't get the device to respond. Nadda. The battery charge lights were dead and non-responsive. I tried several sets of batteries, all fresh, with no results. After an hour of use, the TekCharge was dead. Awesome. I want the TekCharge to work--it's perfect, in theory, for what I need. I contacted Tekkeon, and they promptly issued a RMA. I'll hopefully receive the replacement unit in a few days, and hope to have better luck this time around--my unit may have just been an isolate fluke. But, needless to say, I'll give it a thorough run-through before I make up my mind about the gizmo.